I spent the middle of the week at Red Herringâ€™s CMO Conference where the theme was “Understanding the Technology Customer.” The big themes I heard. – The rise of the web Larry Webber, the web is not another vehicle, it is the vehicle. – The Googlification of marketing success is directly tied to how effectively companies turn their customers into their sales force without advertising. – Use of internet tools (such as email) to achieve near term ROI at the expense of lifetime value of the customer. The dapper and gracious Alex Vieux wrapped up with his top 10 takeaways from the conference. Number two – Branding is not a marketing issue it is a business issue. This rang true as I went back to hotel. Lest the entrepreneurial live seem too glamorous, I was again too cheap to stay at the conference hotel, so I stayed at the Holiday Inn Express Encinitas. 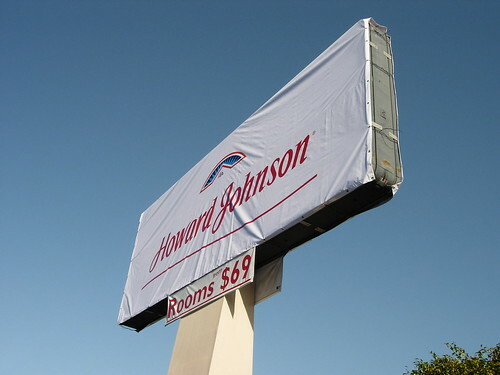 Or so I thought, as that very day the hotel had been turned into a Howard Johnson. Neither brand has much of a connotation in my mind. And I don’t spend much time thinking about that which I can not control. Not so their cliental. Checking in at 10:30 PM and checking out at 7AM, I stood in line as guests voiced their anger in person and on the phone. What would this mean to their rooms? What about their reward points? Would their reservation still be valid? Do they still serve breakfast? The patient desk clerks answered the questions and only complained that their new uniforms had not yet arrived. To me it was the same hotel, they just changed the name, but not to their customers. Somewhere the branding team at Holiday Inn is smiling.